Need to get rid of Silverfish and Firebrats? What are Silverfish and Firebrats? Silverfish and Firebrats have long tail-like appendages coming out of the tip of the abdomen. They have chewing mouthparts, long antennae, and the body is nearly always covered with scales. These insects have a carrot-shaped body. Silverfish do have a silver coloration; firebrats are darker in color. They both move fast and are often found in the bathtub or sink where they get trapped due to the slick surfaces. Silverfish love paper products. Thus wallpaper and libraries are enticing to them. You could find evidence in books and articles that are stored for long periods. Silverfish do not typically damage books that are in regular use. They also like natural fibers such as silk, wool, and cotton. Firebrats prefer rayon. Damage by silverfish can be noted by the presence of feces, scales, and irregular slit marks on fabrics. They are attracted to items of clothing that have not been laundered. Both pests like attics and shake roofs. They will enter residences and places of business through canned lights, and cracks and crevices. If you have an issue with these pests and want additional information, please call our office for prevention and treatment options. When we treat for Silverfish, we request that you be gone from your home for 3 hours. We treat the interior crack and crevice areas of your home and fog the attic. We also treat the exterior perimeter of your home. We request that you remove all items from your clothes closets also so that we can treat the crack and crevice areas there. Move all items 2-3 feet away from walls to allow for baseboard crevice treatment. Also if you store items in your attic, please cover them with plastic or a sheet. Items might need to be moved by the homeowner so that the technician can gain access to this area. What will the pest control operator do to my home to treat for Silverfish? A fine insecticide spray will be applied to all infected and potentially infested areas. These areas could include doorframes, window frames, cracks and crevices, and attic spaces. We also treat the exterior perimeter of your home. Will all Silverfish die immediately after treatment? Silverfish are hard to control. This is why we treat your home two times, the initial treatment and then again at 60 days to re-fog your attic. 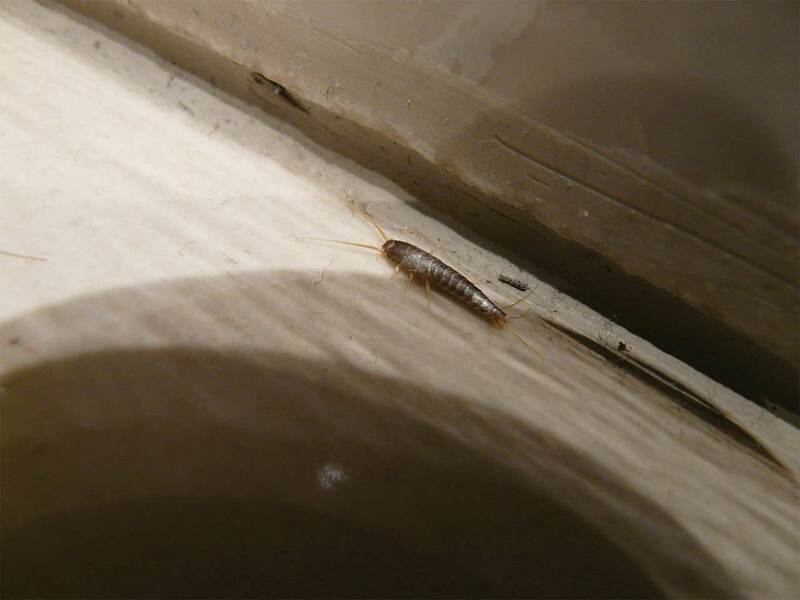 Don’t be alarmed if you see some Silverfish for the first month or so after treatment. They will come into contact with the residual product and die. How long should I stay out of my home after the treatment is completed? We recommend that you stay out of your home for 3 hours. If you have young children or elderly people living in your home, increase this time away. Pets should be out of the home too. When you return home, if you detect an odor, you might want to air it out for a few hours. Some people notice an odor and others don’t.